The ultra-light, all carbon fiber supercar fuses the vision of F1 and Indy Car racing champion Fittipaldi, iconic Italian design company Pininfarina and race-bred German engineering firm HWA AG, and fulfills Fittipaldi’s dream to produce a car with fierce track-racing capabilities, for drivers of all skill levels. “I have tried for years to explain to others what it truly feels like to be behind the steering wheel of a championship racecar. There is adrenaline and elation all rolled into an awe-inspiring inner fulfillment that leaves you craving for more. This is what our dream team created in the EF7 Vision Gran Turismo by Pininfarina,” said Fittipaldi of the first car to be released under the Fittipaldi Motors marque. Revealing a commandingly sleek design underscored by an extraordinary power-to-weight ratio, the supercar’s design theme – that of a shark, inspired by Emerson – finds astounding aerodynamic expression in the vehicle’s flowing, aggressive lines; assertive yet incredibly beautiful and pure; and a balance between emotion and efficiency typical of Pininfarina’s design work. “The EF7 is an exciting car that embodies Pininfarina’s DNA in terms of style and innovation, Emerson’s championship race experience and HWA AG’s flawless engineering skills. Our collective team was able to turn a dream into a driving machine,” enthused Pininfarina Chairman PaoloPininfarina. The EF7’s exceptional yet forgiving handling and performance, will be achieved through a powerful V8 naturally aspirated engine, integrated gearbox, suspension and braking system developed by HWA AG, and an with ultra-lightweight, all carbon fiber chassis construction with an exceptionally low center of gravity. “I have had the privilege to work with many great teams in my life on and off the track, but this project took me to new heights, co-creating with the masters of legendary car design and race-winning engineering,” said Fittipaldi, who began his journey to create a supercar three years ago. “Combined they have over 140 years delivering on the elite cars of the world and this is now the same brilliance in the Fittipaldi EF7 Vision Gran Turismo by Pininfarina." The TOP GEAR MAGAZINE dedicated an incredible review about the EF7 and how the champion accomplished "His dream". Talking to Qatar Tribune on the sidelines of an event to unveil the car, Fittipaldi said that Qatar is a big market for such cars as the country has good Grand Prix tracks. Paris, Frankfurt, and now London all offer great motor shows, but the Geneva Motor Show is undoubtedly the most important of the European motor shows - and perhaps the most important globally. Could we really ask for anything more in the world of driving? The Geneva Motor show is certainly Europe’s premier automotive convention. Though Switzerland lacks a native automotive industry, it is surrounded by some of Europe’s greatest car-building nations—Germany, France, and Italy (England isn’t too far away either)—and it hosts an affluent population. As is the case with all hypercars, the EF7 will have a limited run of production and bespoke options to the owner’s specifications including interior and exterior, wheel, color and racing numbers, and signature branding placement. However, vastly different from every other hypercar, each owner of an EF7 will have the opportunity to receive personal coaching from Fittipaldi and move up a driver-training ladder designed by him. Owners will also be able to join the Fittipaldi Racing Club for exclusive VIP driving and racing experiences around the world. The ultra-light, all carbon fibre supercar, is the first car to be released under the Fittipaldi Motors marque and has a sleek design inspired by the lines of a shark, with an extraordinary power-to-weight ratio. It has been designed as a racer that is supposedly so easy to use, it can be operated by non-professional drivers. You’re looking at the result of combining that brief with the vision of two-time Formula One world champion and double Indy 500 winner Emerson Fittipaldi and the styling know-how of illustrious Italian design house Pininfarina. It’s called the Pininfarina EF7, it’s got 592bhp and 310lb ft from a naturally-aspirated V8 specifically designed for the car by HWA (that revs to 9,000rpm), and you’re absolutely definitely not allowed to take it anywhere near a public road. The former F1 racing star and Indy 500 champion, Emerson Fittipaldi, today unveiled his dream track car, designed to fulfil his long-held ambition of bringing the thrill of F1 racing to the public. 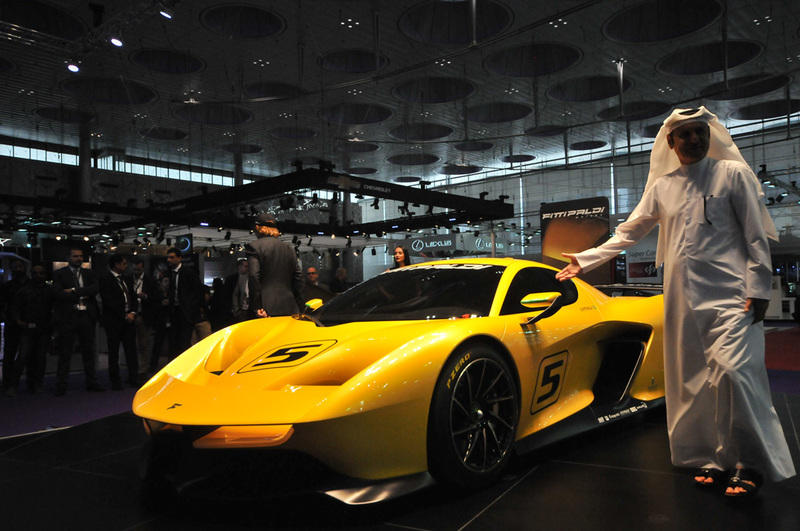 The much-anticipated Fittipaldi EF7 Vision Gran Turismo by Pininfarina made its debut at the Geneva Motor Show. And if your racing mettle doesnot quite elevate itself to the real thing, a PlayStation video game has also been unveiled featuring the hypercar. The car’s architecture is a carbon-fiber monocoque, which would be “good enough” for most manufacturers in terms of safety, but Pininfarina and HWA AG went further and exceeded FIA safety standards by integrating a full roll cage, race grade crash elements in the front, rear and sides, and added a set of tailor-made, one-piece, fixed racing seats with six-point racing harnesses. 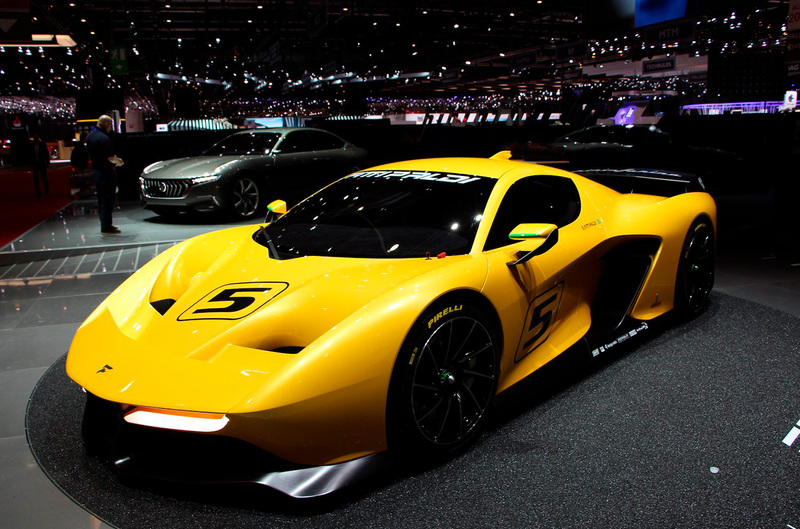 Former F1 racing champion Emerson Fittipaldi teamed up with Italian auto design company Pininfarina and German engineering firm HWA AG to produce the Fittipaldi EF7 Vision Gran Turismo supercar, unveiled for the first time on Tuesday at the Geneva Motor Show. Three years in development, the EF7 is designed as a high-performance track car with friendly handling, so drivers of all experience levels can get the best from it, with multi-stage traction control and ABS. 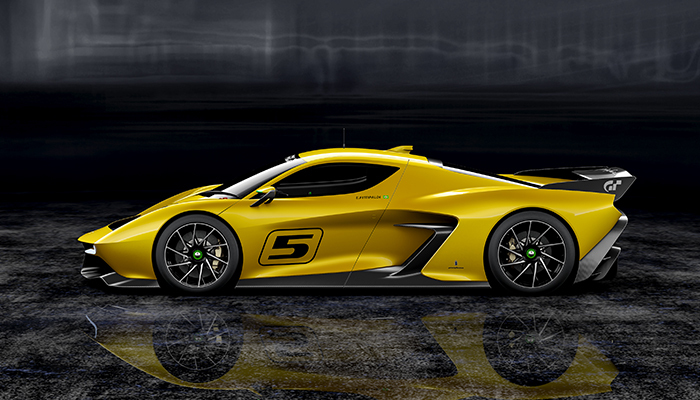 'What was important to me in creating the EF7 is that the car not only provides pure passion and adrenaline but will also be forgiving and safe for drivers of all skill levels,' said Fittipaldi. To make his dream a reality, Fittipaldi called in the pens at Pininfarina, the Italian carrozzeria, and German engineering firm HWA AG – HWA as in Hans Werner Aufrecht, as in the A in AMG. The sculpted all-carbon superconcept’s shape is exactly what you would expect if the Ferrari favorites in Cambiano built DTM cars, it’s staggeringly pretty yet nothing superfluous, ruthlessly functional and focused in racy kinda way. It's obvious watching and listening to a jovial Emerson Fittipaldi talk about his car on video that he's passionate and knowledgeable about every piece. He has the air of a man living out his personal fantasy—in this case, building a reliable race-capable supercar for drivers of all levels. 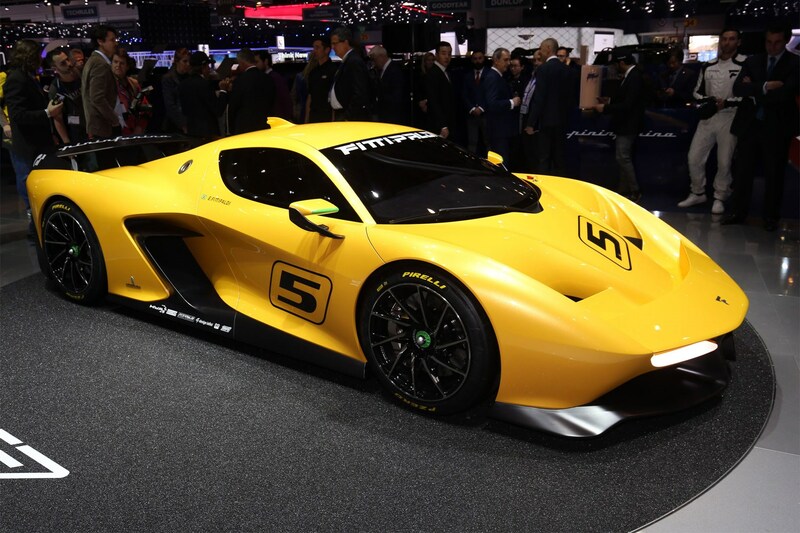 The two-time Formula 1 world driving champion and two-time Indianapolis 500 victor chose the Geneva auto show to unveil the first prototype to emerge from Fittipaldi Motors: the Fittipaldi EF7 Vision Gran Turismo by Pininfarina.